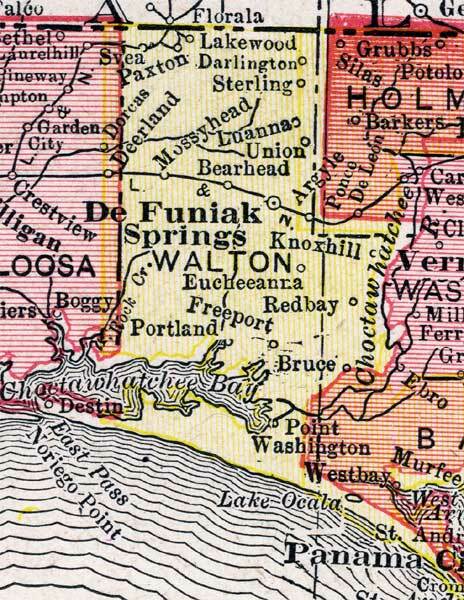 Walton County was created on December 29th, 1824 from Escambia and Jackson Counties. It was named for Colonel George Walton, Secretary of the Florida territory from 1821 to 1826 during the territorial governorship of Andrew Jackson. Walton was the son of George Walton, Governor of Georgia and signer of the Declaration of Independence. Alaqua is named the first County Seat of Local Government. 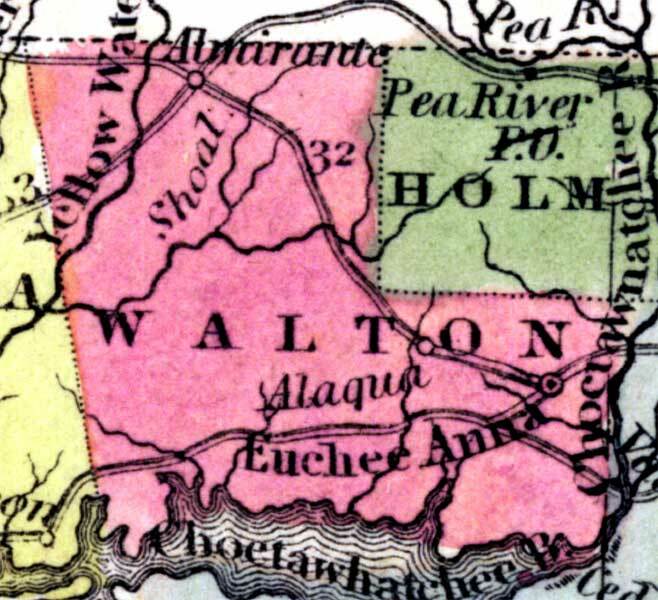 Above - Walton County as shown on Sidney E. Morse's 1845 A System of Geography for the Use of Schools. Of interest, this map is the first school atlas to make use of the cerographic process, also created by Morse. This process allowed an original of the map to be drawn as a positive, unlike earlier ways of creating maps, which required the original to be a negative image of the map. It had significant impact on map making and became a widely used process. Above - 1850, Map of Florida, published by Thomas, Cowperthwait & Co. Above - 1856, Surveyor Map from 1856. 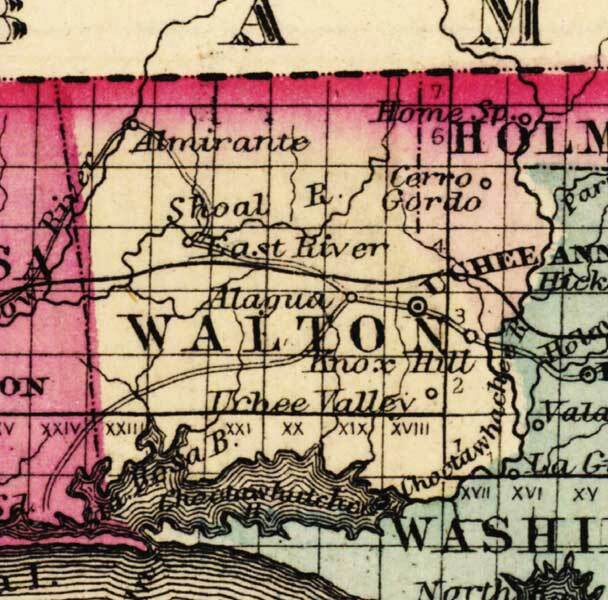 Above - Walton County as shown on a 1859 Surveyor General map. This map was created to accompany the annual report of the Surveyor General. It is a township map showing drainage, cities and towns, railroads, location of the land grant railroads and indicates the 6- and 15-mile limits of grants. 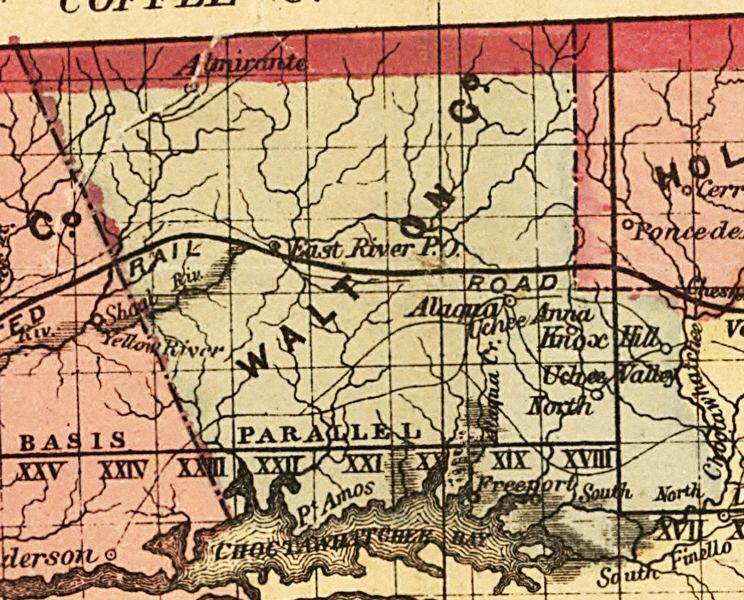 Above - 1863, Map of Florida that was, "Entered according to Act of Congress in the year 1863 by A. J. Johnson in the clerks office of the District Court of the United States for the Southern District of New York." This is the last map found the identifies the location of Alaqua, which was the original county seat until a fire destroyed the building and public records about 1844-45. The new county seat was moved to Eucheeanna in 1845. 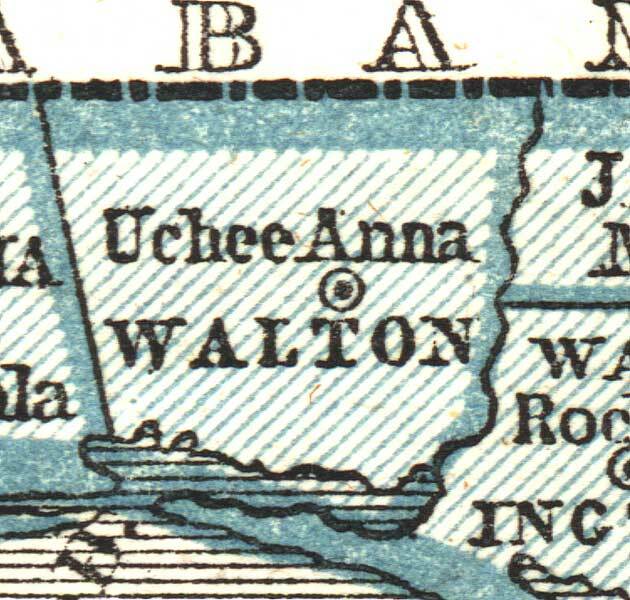 Above - Walton County as shown on a 1882 G.W. 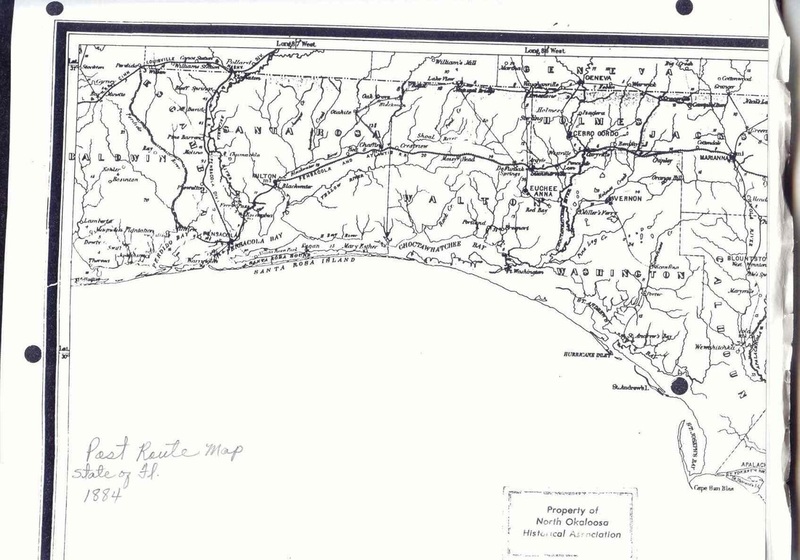 & C. B. Colton and Company map showing the Florida Transit and Peninsula Rail Road and its connections. The solid blue line indicates the railroad line. 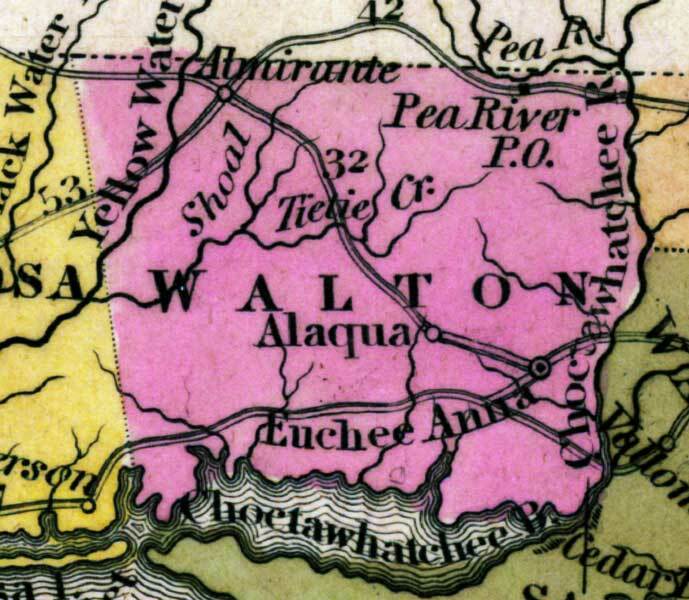 New Boundary of Walton County is shown. 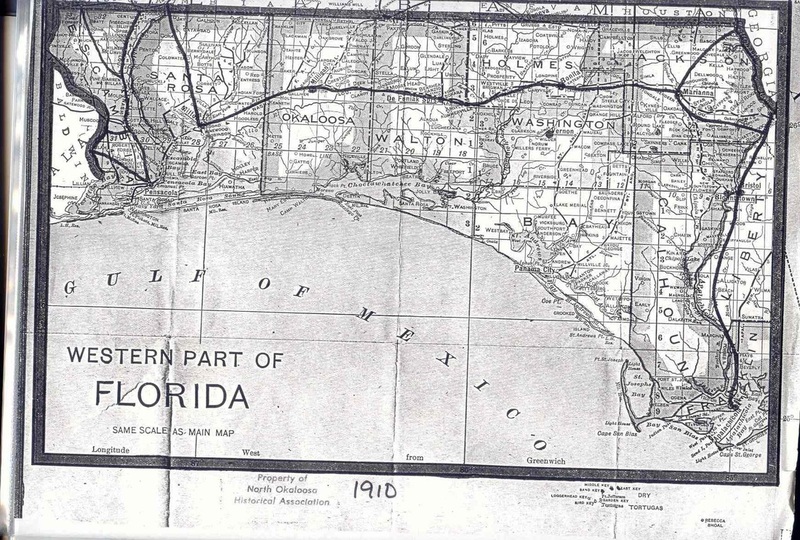 Okaloosa County was formed from a portion of Walton County in 1915. Above - 1932, United States Geological Survey.